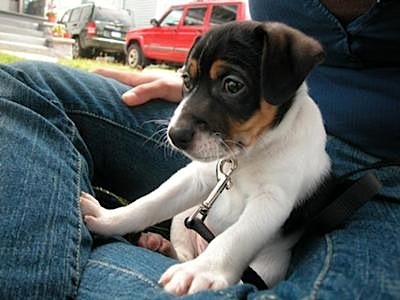 Coltrane is a loving little JRT that was born in rural Pennsylvania. We picked him up and brought him home to Buffalo, NY. It seems that he loves the city life a lot more - there are lots of things for him to discover on walks. Of course he loves to play and keeps us so busy keeping him out of trouble! How can you resist his cute little face! Mr Coltrane is awesome...cute as a button! With that face I'd just have to give up and sign over all of my material possessions and time on earth. Thats a fine look'n boy-congrats!